Independent Living at The Chesapeake in Newport News, VA, makes it easy to feel right at home. Our beautiful cottages and spacious senior apartments open the door to a vibrant, carefree lifestyle surrounded by like-minded friends and neighbors. And we offer a wide array of floor plans to ensure you’ll find the right one that fits your lifestyle. 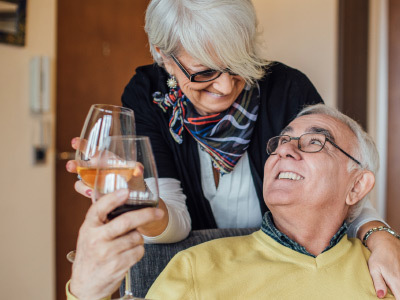 The Chesapeake is well known as the premier retirement community in the Hampton Roads area, with everything you need right at your fingertips. With our exceptional amenities, programs and hospitality, every day is filled with choices to enhance your mind, body and spirit. Leave the headaches and hassles of housekeeping, home maintenance and lawn care behind. We do all that for you. That’ll free up your time to get your hands dirty with our gardening club, enjoy aqua aerobics in our indoor saltwater pool, let our expert culinary team prepare your meals to perfection, and so much more. Best of all, Life Care at the Chesapeake alleviates financial and health care worries by providing peace of mind and security today and for your future. Of all the senior living communities in the Newport News, VA, area, you won’t find one finer than The Chesapeake. To discover more about the advantages of Independent Living at The Chesapeake in Newport News, VA, please fill out the request form. The little extra care you need, a lot of independence. Innovative support in a secure, loving environment. 5-Star-rated health care for the short and long term. Get back to the life you love sooner. Have the best in senior health care services right outside your front door. To learn more or to schedule a tour of our beautiful community in the Hampton Roads area, please fill out the request form. Receive a brochure with your request form submission.